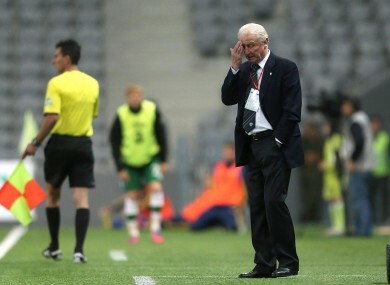 Ireland manager Giovanni Trapattoni watches last night's match. LAST NIGHT’S PERFORMANCE against Kazakhstan only served to enhance the level of disillusionment that many supporters feel towards the Irish team. While Ireland ultimately escaped with three points, the manner of the performance was so poor that it had some people, including RTE analyst Richie Sadlier, calling for the manager’s head, while #TrapOut trended on Twitter. However, others such as John Giles and Liam Brady argued that the FAI should persevere with the manager for the remainder of the campaign at least. While it may not have been pretty, Trap succeeded in ultimately securing a win, albeit against a side ranked number 142 in the world. Trap’s pragmatic brand of football was enough for Ireland to reach the Euros, however the side’s subsequent failure in the tournament led many fans and pundits to express hope that the Italian would alter his methods and tactics substantially. Nonetheless on last night’s evidence, he appears unwilling to change the side’s approach – a philosophy that has frustrated so many followers of the Irish team. So with all that in mind, do you think Trapattoni has taken the Irish team as far as he can? Yes, the style of football isn't good enough. He must go immediately. Wait until the end of the qualifying campaign to decide his future. No, he's doing a great job with limited players. He deserves more respect. Email “Poll: Has Trapattoni taken the Ireland team as far as he can?”. Feedback on “Poll: Has Trapattoni taken the Ireland team as far as he can?”.